This charming craft-wrapped gift hearkens back to the times of sitting around a cracker barrel, Christmas carolling, and nostalgic memories. Decked with rafia ribbons in green and red. 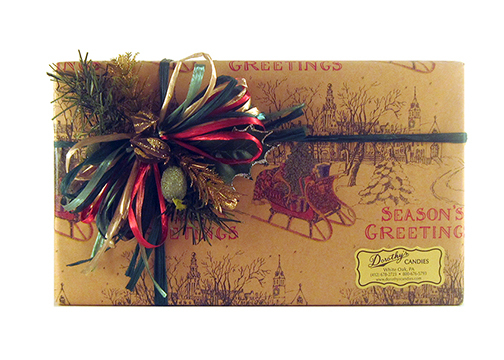 This gift is sure to charm -- and of course, the generous two-pound size means plentyof hand-crafted Dorothy's Chocolates to share for more good cheer!